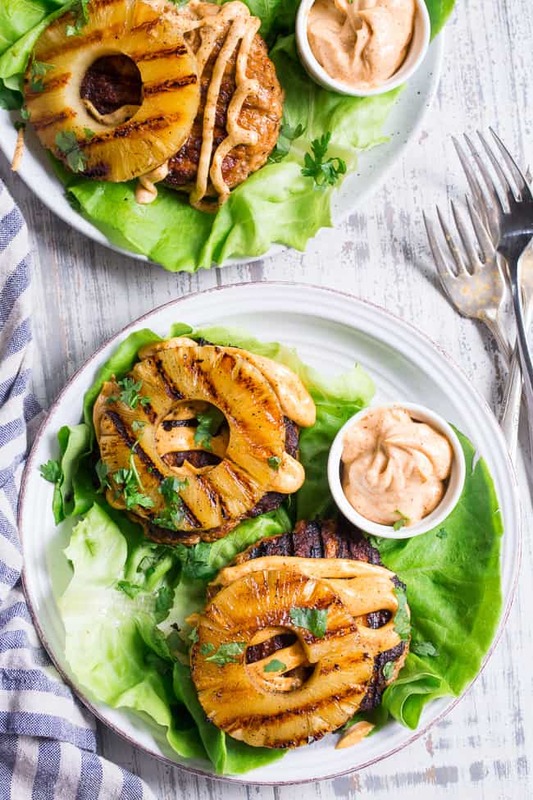 These grilled Hawaiian Chicken Burgers are super quick to make, packed with flavor, spice and they’re Whole30 compliant! Serve in butter lettuce wraps topped with plenty of chipotle ranch for an easy weeknight dinner. Perfect for grilling season or anytime! Did you know that I eat burgers WAY more than I post them? I’m thinking of changing that ASAP – because burgers, generally speaking, are one of life’s little pleasures that no one (but especially Paleo peeps!) should live without! When I think of burgers, I’m thinking outside the bun (of course) to flavor and toppings. 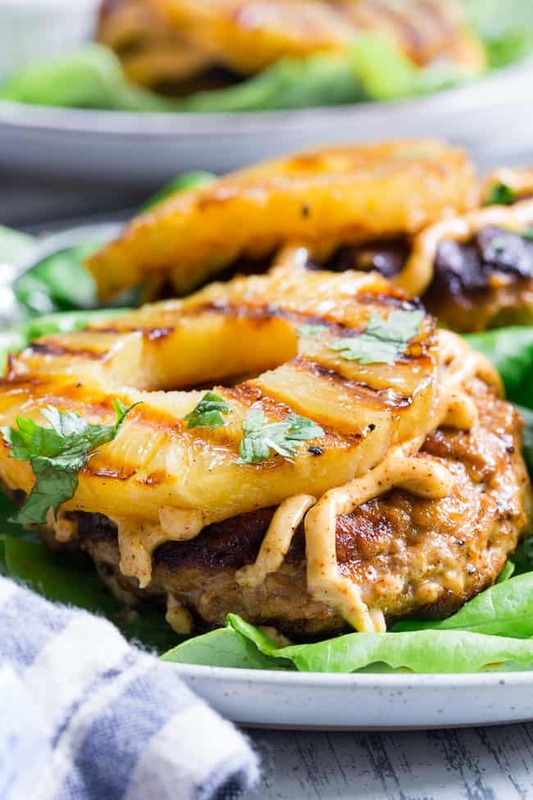 I want the entire plate to be exploding with flavor, whether we’re talking about a good ‘ol bacon burger with sweet potato fries, or something a bit different, like these hawaiian chicken burgers! I actually make chicken burgers quite a bit, FAR more than I make turkey burgers, for one thing. Chicken over turkey when it comes to burgers, always. Maybe it’s the higher fat content (I never go for a really lean chicken) or how the meat blends with the seasonings. Whatever it is, chicken burgers are sometimes even my #1 ground meat for burgers for how versatile and flavorful they are without being too heavy. For these, I decided to go for a spicy, but not TOO spicy (since I’m a wimp), juicy chicken patty topped with my chipotle ranch sauce (heaven) and sweet grilled pineapples, for the perfect savory/sweet blend. Maybe even better than how they actually taste, are how fast and easy these burgers are to make! That’s one of the best things about any burger, I guess you could say! Simply mix the chicken with the seasonings, preheat the grill (or grill pan if you’re cooking indoors) and cook. 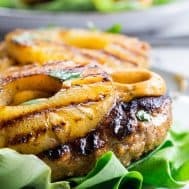 The pineapples can grill right alongside the burgers if you have space, and need just a minute or two to get all nice and golden brown. The chipotle ranch sauce is a one that I use constantly in my own meals. I really can’t go a week without making this dip/sauce! It’s super easy to stir together if you already have homemade mayo (or paleo store bought mayo) around, so you can prepare it while the burgers grill, before, or after. Whatever you do – don’t skip it! It takes these hawaiian chicken burgers to the next level of flavor and makes them oh so satisfying and filling. I hope you’re up or grilling and letting a new favorite burger into your life – let’s get started! 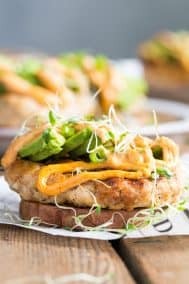 These grilled Hawaiian Chicken Burgers are super quick to make, packed with flavor, spice and they're Whole30 compliant! Serve in butter lettuce wraps topped with plenty of chipotle ranch for an easy weeknight dinner. Perfect for grilling season or anytime! Prepare the chipotle ranch sauce prior to starting- Mix all ingredients in a small bowl until well blended and refrigerate until ready to use. Preheat your grill or grill pan to medium high heat and brush with coconut or olive oil. In a large bowl, mix ground chicken with coconut aminos, salt, paprika, chili powder, cumin, and garlic powder. Since the meat mixture will be somewhat sticky, wet your hands with water, then form into patties. Grill about 3 minutes on each side, until juices run clear. The first side should be nicely charred before flipping. 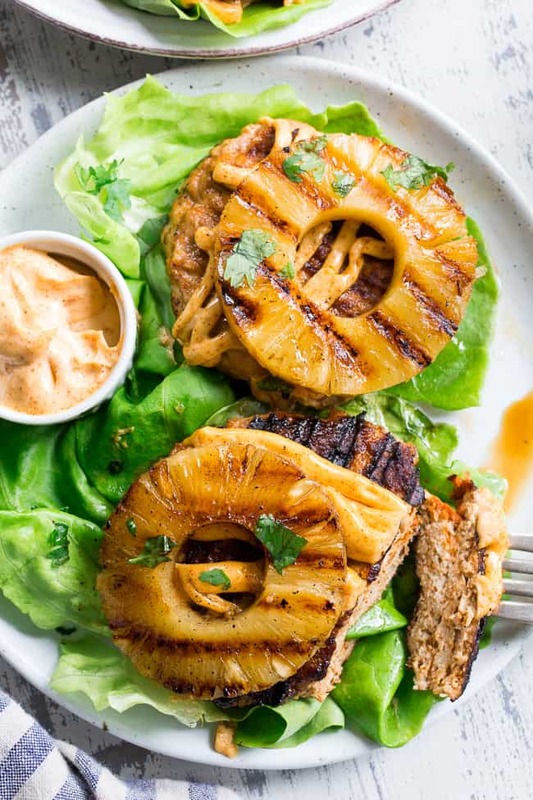 If you have room, you can grill the pineapple slices alongside the chicken burgers for the last 2 mins of cooking time, flipping after the first side has deep golden brown grill marks. 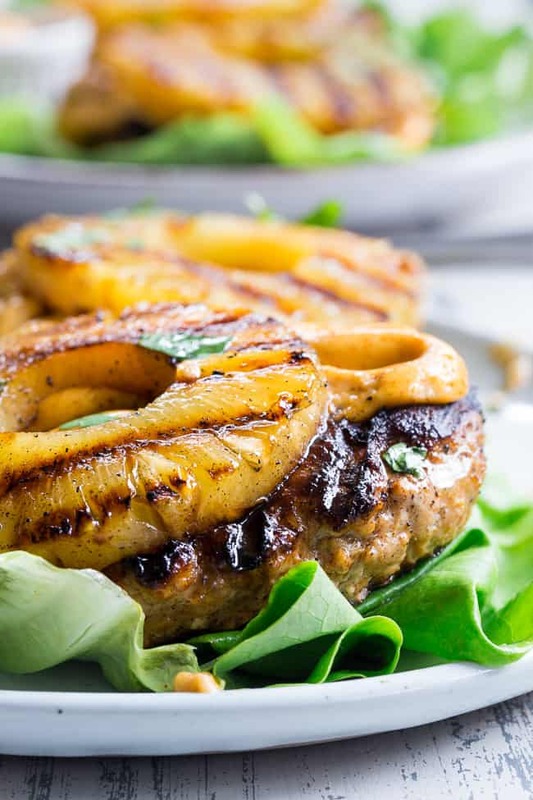 To serve, place burgers over butter lettuce, then top with chipotle ranch sauce and a grilled pineapple slice. Garnish with thinly sliced green onion or cilantro for garnish. Enjoy! 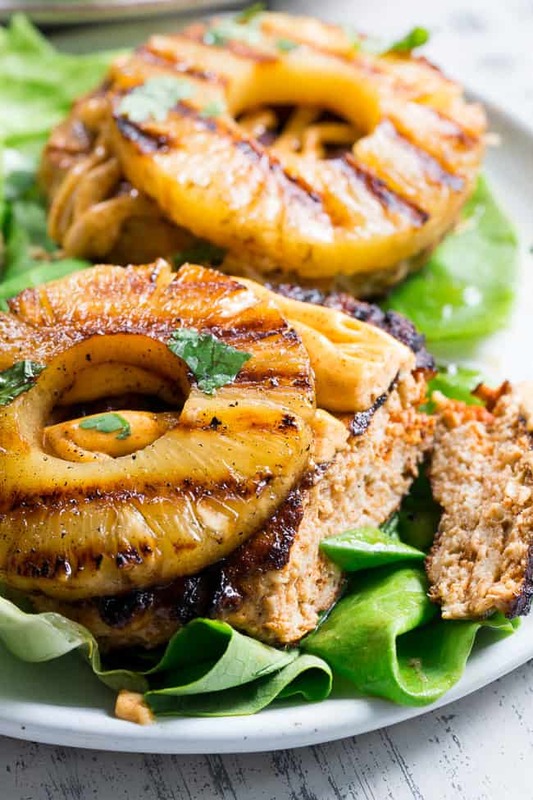 If you love these Hawaiian Chicken Burgers, you’ll like these similar recipes too! These look perfect for the summer grilling season. I love all your recipes so can’t wait to add this one to the mix! I’m sure you’ll love it! Enjoy! Just wanted to let you know, I absolutely love your recipes and site. You are my go to favorite since we went low carb! I’m thrilled you’ve been enjoying the recipes! Made these today. Really easy and taste great! Love the flavor combo of all the spices, chicken and pineapple. I’m all about the new burger recipes…especially since I finally have a grill and it’s SUMMER! Good tip to know with chicken versus turkey burgers too. Delicious and so easy. Adding this one to my favorites! Hey, planning on making these this weekend. Question about pineapple, I grilled pineapples before and they came out dry on the grill. Did you marinate them? Chicken burgers might not be a crowd pleaser, do you think the flavors would work with beef burgers or should I stick with chicken? Thanks for the recipe, comes in a good time, otherwise it would have been another burgers and dogs day! These were AMAZING! Even my picky kids devoured them. 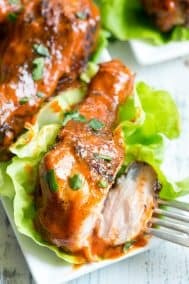 The grilled pineapple is an amazing touch and the chipotle ranch is so delicious that I took the leftover lettuce and just scooped it up and ate by spoonful! They were very good! Have one question , under ingredients you list 1/2 of chipotle sauce. Are you suppose to add to mix meat? Should you use the other 1/2 chipotle sauce for next time? Nope it’s just to top 🙂 I think that was supposed to say 1/2 cup. Glad you enjoyed! Made these yesterday for my neighbors and they turned out great. Wetting my hands when making the patties was a great tip to deal with the sticky ground chicken. Just wanted to say that I don’t know if I could get through a Whole 30 without you Michele. Your recipe site is my “go to.” I just made the Chipotle meatloaf the other day and my whole family loved it. I can’t wait to try these chicken burgers. Thank you for the time you take to share these wonderful recipes that you put together beautifully:) And thank you for saving my Whole 30 time and again!!! These burgers and the sauce were amazing! This recipe will definitely be a regular menu item in our house!